And we're already heading towards Zoisite's death. And given that I'm sentimental, I'll here tell the episodes in details, and I'll put a lot of pictures (at least the upcoming episode was well drawn). 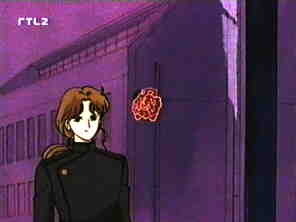 Zoisite appears on Mamoru's TV as this one arrives home from their night fight. Zoi says that they now know his secret identity, and offers to fight a duel over the Nijizuishou in the evening. You can't see it because it's a still pic, but he was playing with that lock of his hair all along, and that was *cute*... *g* Me likes Zoi. Uh, wasn't that obvious yet? Mamoru accepts (despite his wound). On sunset, Mamoru heads to the unoccupied Starlight Tower where the duel is to be set. 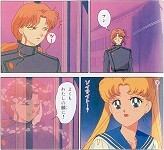 Usagi (Sailor Moon under her human identity) follows him as she noticed he was wounded and worries for him. 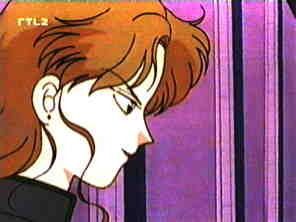 Zoisite senses his approach and teleports both Mamoru and Usagi, since she was with him. I have to explain here that at this point of the story, none of these people knows about each other's double identity, except Zoi knowing that Mamoru and Tuxedo Kamen are one and the same. Usagi ignores it, and likewise both he and Zoi ignore that she is Sailor Moon. Usagi went unconscious from the shock. So she doesn't hear while Zoi settles the terms of the fight : he deposits his 5 Nijizuishou in the middle of the huge room, between him and Mamoru, and says the winner will get them. 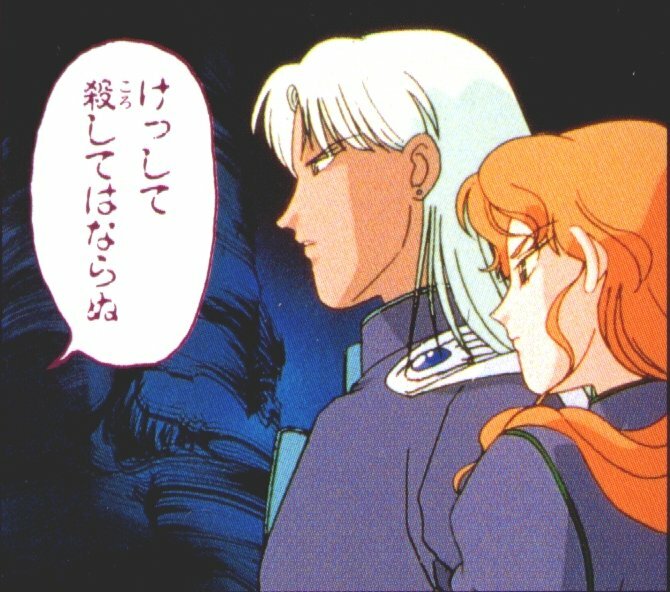 Mamoru asks that he'd release Usagi, and Zoi says she'll be free after the fight. 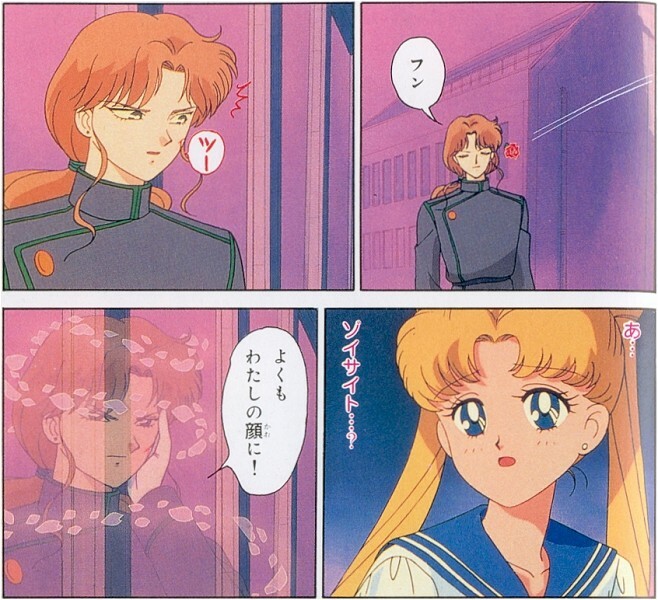 Mamoru then goes to the middle of the room and places his 2 Nijizuishou there, then steps back to Usagi. 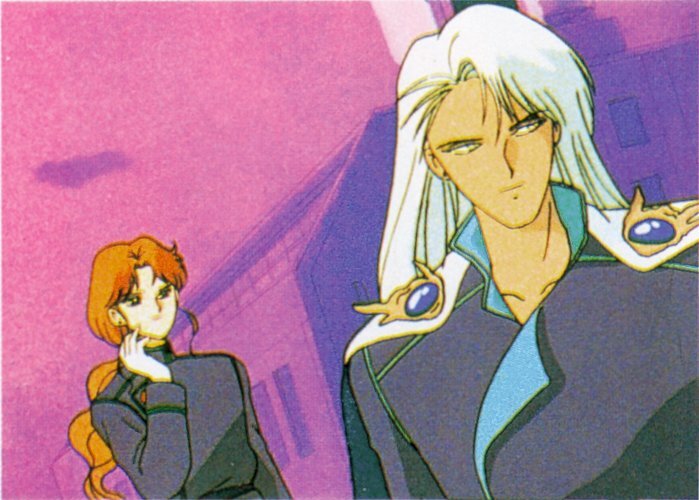 A surprised Mamoru sees Kunzite materializing in the middle of the room, too far to reach, grabbing the whole 7 Nijizuishou telekinetically. 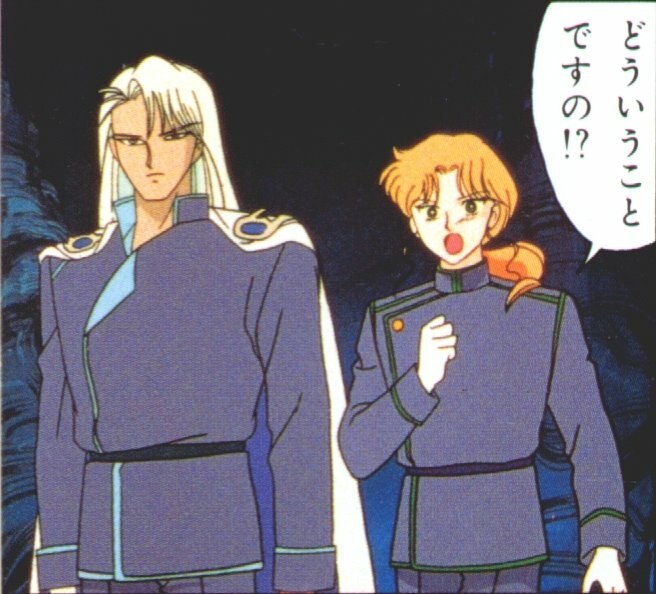 Zoisite warns Mamoru not to try anything or he'll fry Usagi. 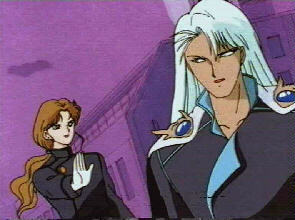 Kunzite tells Zoisite that he lets him take care of them, and teleports. 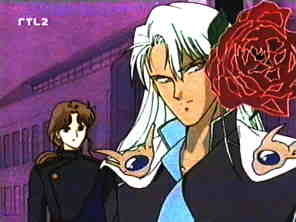 Mamoru sends him a red rose (that's his basic attack. Don't ask), but since Kunzite he's already half gone, the rose continues and hits Zoisite. The blow is not dangerous, but it *gasps* wounds his face (red blood! 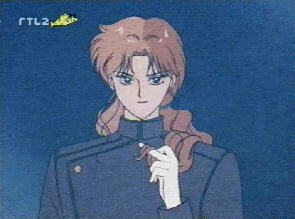 He has red blood, unlike Nephrite). 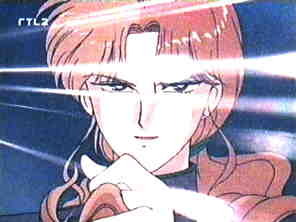 So Zoi is now *mightily* pissed off at Tuxedo Kamen and vanishes in a swirl of sakura petals. Usagi wakes up just in time to see him disappear. 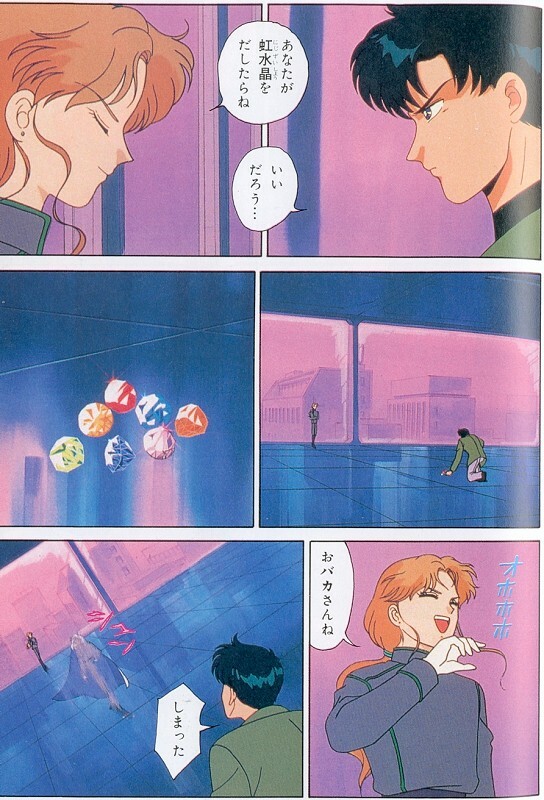 The floor starts to crumble under her and Mamoru's feet, and they run to the elevator to save their lives. They realize that they're not safe, as it's already partly converted into a throbbing half-plant half-dark stone wall looking like the Dark Kingdom... and the door dissolves into a solid wall all the same. They're trapped, and the elevator starts moving up.